It's #FetishFriday in Anita World! New black latex catsuit photo shot and art directed by David Radford at Manse Studio during my trip to Wales earlier this month. Knee-length patent boots by Fabulously Fetish, catsuit by Murray & Vern! After a chilly but productive day of shooting summer fashion and nudes at pretty locations around North Wales, I drove to South Wales, stayed the night in another hotel (again finding myself too tired to go anywhere for dinner once I arrived- just hot shower, kale salad leftovers, brown rice cakes dipped in houmous, cammomile tea, book and bed!) and then drove to my sold-out Manse Studio Day, at which the "horsey" photo was shot :) If you are a photographer interested in booking me at a studio day, please read my last blog. Although it added a lot of time onto my trip, I really enjoyed driving around Wales. The drive from North to South at night was most amazing because you could drive for ages without seeing a single light from a house or street light. There was just nothing except the car's headlights, winding round the mountain passes, in and out of valleys, and occasionally through sleepy little villages with long hyphenated names on the signposts. The only other light was from the stars :) Living in England, I always forget that wild places like this still exist in Britain. I would love to live somewhere so magical and untouched. The drive from the hotel to Manse Studio the next morning was even more heavenly and breathtaking as I had to drive through snow-covered mountains in bright sunshine! It was just glorious to drive through the most stunning snowy panoramic views with the heater and the music turned up high! Cover of USA's Twisted Edge magazine- latex cat and mouse! I'm on the cover of issue #20 of the USA's Twisted Edge magazine. It came out a while ago but I've just been too busy to post about it, even though I'm thrilled! Shooting/ organising shoots around the clock is also why the editorial is not accompanied by an interview with me- I was offered one but very sadly didn't have time to actually do it. Time for a trip to Glastonbury to buy my organic hair dye, get some beauty treatments and maybe treat myself to a natural lavender candle for my trip to Wales on Thursday (I'm free anywhere between Bristol and Bangor on Thursday, btw, if anyone wants to shoot). I'm shooting two full days and then spending two nights in hotels, so I think it would be good to just relax, read my books, write about my thoughts and maybe try and meditate during the evenings at the hotels. I love to light scented candles in my hotel rooms, it instantly makes them feel more luxurious and like home! had a kind of triple birthday celebration: Madame Bink came to visit the night before my birthday and we camped out in her van in Cheddar Gorge in the snow! What an experience! When we woke up in this incredible landscape in the morning, the sun was shining off the snow, the birds were singing and the wild goats were everywhere! The next night, I went to see Die Antwoord, then got driven back to Somerset for a private party at a hotel being thrown for me, which was a lovely surprise! I will really miss my friends in the Southwest if I ever have to move away! completely sold-out, packed-out London Tour, that then got extended to London & the Southeast, then London, the Southeast and Hertfordshire, then London, the Southeast, Hertfordshire and Cambridgeshire, then London, the Southeast, Hertfordshire, Cambridgeshire and East Anglia, so I ended up being unexpectedly away from home for two very productive weeks of shooting dawn to dusk every day. I got to see Roswell Ivory tons while touring and really felt like we bonded :) We had an awesome end to my tour by raving our arses off at Perou's party in London for the launch of the second issue of Edict magazine, and meeting some interesting people in our little industry like David Wood and Viktoria Modesta. 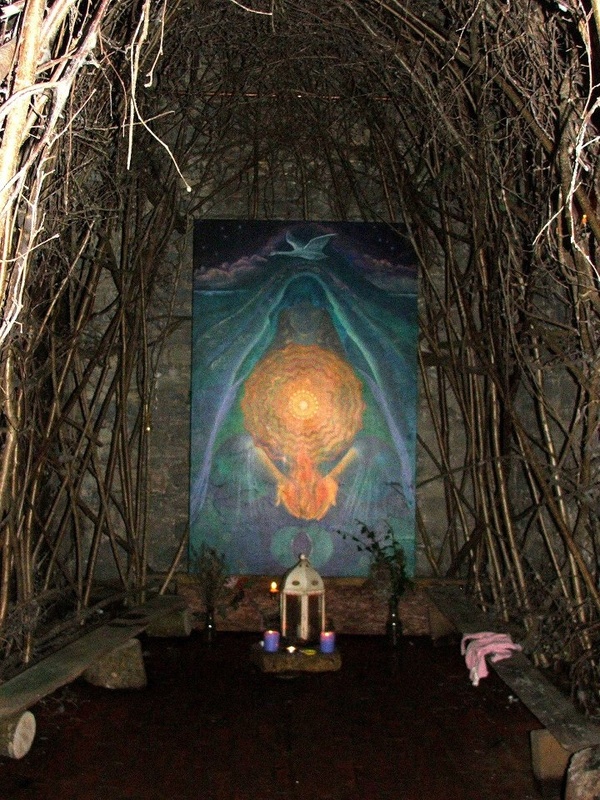 Back home in Somerset after the tour, I slept for 48 hours and then went to the White Spring Temple in Glastonbury for a belated Imbolc on 3 February. One corner of the temple is dedicated to Brigid, so it seemed the appropriate place to go! My next big tour is in March, so if you are interested in shooting with me in or around Hertfordshire, Kent, London or anywhere between Bristol and London (Norfolk is now sold out), please email me at contact@anitadebauch.com asap. I can offer suggestions for local studios to shoot at at discounted prices. PETA is looking to work with me again, so hopefully I will be in London towards the end of next week (27 February - 1 March), if anyone would like to shoot while I'm there. Much love, and I hope you are all enjoying the winter sun!